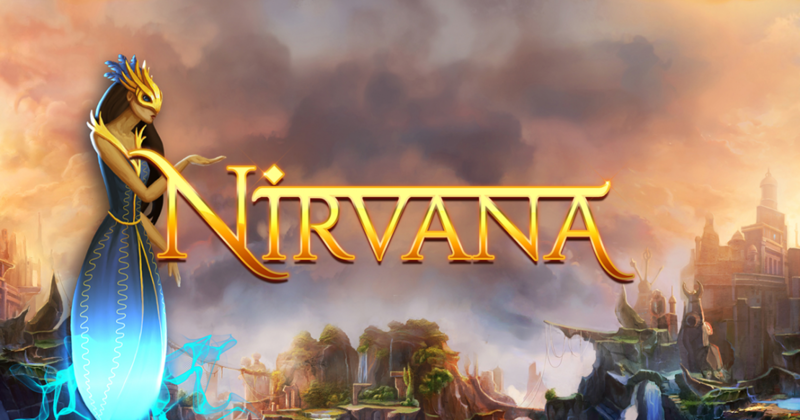 In Nirvana you will find a wonderful game, being one of the slot machines created by Yggdrasil, which manages to give you a fantasy like design, with some very cool features and the graphics to match. You will discover a total of 20 paylines on which you place your bets, and in return the game rewards you with payouts that reach $25,000. The theme appears to be fantasy inspired, especially when you look at the goddesses which appear when you trigger free spins, or at the weird animals which are used for some of the symbols. You will find rabbits with deer horns, cats with wings and heads of hawks, or snakes with dragon heads, to give you a couple of examples. While the game tells you how many paylines are used, there is no option to change how many are active. You may modify the coin value though, getting to values of up to $5. The total bet will be automatically modified when you do this, multiplying the coin value by 20, and reaching values of up to $100. The base game will give you two symbols with special abilities, one the Wild, the other marked Free Spin. The wild symbol is a good feature to get, but nothing out of the ordinary happens with it. It’s your typical feature which you use to create combinations that are missing a symbol, but which can’t take the place of the scatter. The Free Spin symbol, with the image of the Lotus Flower, will be a lot more fun to trigger. With two of them scattered on the reels, you receive one free spins. Three to five Lotus Flowers will trigger 10 free spins though. Payouts of 1,000 and 5,000 coins are offered for four or five symbols, respectively. If the round of 10 free spins was the one triggered, you will be offered a choice, between three features, which are called Wild Seeds, Mega Reel or Nudge Reel. Each one has its own advantages to bring to the table.